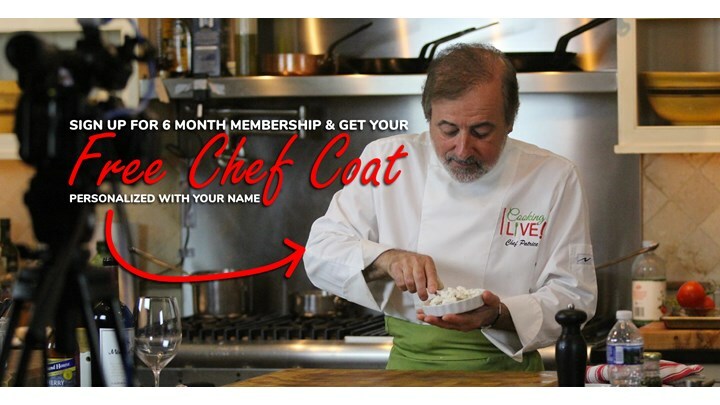 6 month membership GET A FREE CHEF JACKET with your name on it! Cook at your own speed by pausing, rewinding or fast forwarding. As a member, your dashboard will keep track of your past and present classes for your convenience. You can grill them, roast them, throw them in pasta, you can even wrap them in bacon, and the list just goes on and on, so many application for fresh asparagus. For this class you will be making them into a beautiful soup. Garnish with honey caramelized pecans, perfect balance of texture and flavors. This recipe is very easy to make and takes about 30 minutes to execute. Chef Patrice will teach you an easy way to make fresh pasta dough. The sauce is made with fresh grilled tomatoes, wild mushrooms and olive oil and finish with fresh basil and parmesan cheese. Let’s do something special this week! Chicken Paupiette with Spinach and Mozzarella Cheese Wrapped in Bacon. Braised with tomatoes, green olives and mushrooms it makes a perfect dinner for anyone! Bitter orange marmalade is my favorite confiture, this simple but technical recipe give it his justice! Moroccan style salmon bastilla. The procedure is quite simple and well worth the effort. The filling is spectacular as is the filo pastry crust bring a crunchy texture to this dish. When a recipe calls for just a few ingredients it’s important to use the best you can get your hands on. Use whole milk, cream and fresh basil to make this custard that burst with flavor. For the topping fresh cherries compote brings the acidity that this dessert need. I love a refreshing chilled soup and this one just bursts with bright flavors. It’s made with roasted red bell peppers, vine-ripened tomatoes, sweet corn, onions and garlic, but the real magic is the avocado, fragrant of fresh cilantro and a splash of lemon juice. I promise it will wake up your taste buds! Here is the first part of why I think this is a great dish, it’s made with Cognac! A delicious mixture of caramelized shallots, garlic, fresh thyme and freshly grounded black peppercorn sauteed with the shrimp and flambé with Cognac how can this be bad! I really can't begin to describe how much I love this ravioli. Eggplant is the perfect filling with sautéed fennel to create texture you will love them too! Seasoned lamb meatballs simmer in an aromatic tomato sauce with Mediterranean spices. Serve with buttery and lemon scented couscous with toasted pine nuts and dried cranberries. Perfectly seared scallop, creamy eggplant risotto… A perfect starter course for any occasion, or a main dish! Roasted eggplant risotto with basil oil is clearly a winner. I am putting my money where my mouth is and sharing this lovely risotto recipe with you all. If you've never eaten a fresh cherry pie, you're in for a treat. It's a bit of work to pit the cherries but once this is done, there's not much work to do the filling. The ultimate of all of the French desserts to take hold of the American culinary imagination might be chocolate mousse. The simple yet sophisticated, airy yet intense chocolate mousse has been a hit with home cooks in America. This recipe will become the best chocolate mousse recipe in your repertoire! Thai Coconut Chicken Soup takes the goodness of chicken soup to a new level with coconut milk, spicy peppers, nutritious mushrooms and a delicious broth. This is my introduction to braising! This healthier slow cooked beef stew version is very simple but yet hearty, serve over soft polenta carrots and parsnip. What is amazing about this recipe is that the balance between the acidity, the sweetness, the saltiness and the bitterness is so perfect. For this class you will get to practice your knife skill, so sharp your knives and get ready! Tender rack of lamb, makes an elegant roast for a special-occasion dinner, and it's quite easy to prepare a brief marinade of pounded garlic and olive oil for a simple accompaniment, roast small tomatoes and sautéed fresh spinach. This log looks very impressive but is surprisingly easy to assemble. It's easy enough for kids to master but it's a recipe that is enjoyed by everyone. For this class you will crated two soups with the same basic ingredients. The combination between the broccoli and the cauliflower makes it very creamy and unique. Here is a way to use your left over Champagne if you didn’t drink it all! On this class you will get a chance to make a delicious Champagne Sauce with this chicken dish. Easy to make for a large number of people, so if you are searching for an ideas for your new year’s dinner, look no more and sign up for this class. A dish like this one will elevate your cooking to the next level. You will learn how to make fresh pasta dough and the technique used in this class is quick and easy. Fresh shrimp, delicious oyster mushrooms, and a creamy parmesan sauce will make you want more! This upgraded French, classic cake recipe comes from a three Michelin star restaurant. It is very light but rich in flavors. For this class, we will serve this dessert with grapefruit and oranges that are marinated in dark rum. I had the opportunity to taste this traditional Polynesian dish during my stay in Papeette and enjoyed it a lot. So for this class, I want to share with you this easy and delicious Tahitian chicken dish that will be sure to excite your taste buds. The base of this cake is biscuit dough rolled in melted butter and sugar. The addition of pineapple brings another layer of texture and it goes perfectly with coffee or tea! This is a perfect dish for your holiday parties. The flavors are powerful and the textures are just right. This recipe is from the famous chef, Chef Michel Richard. It is easy to make and an inexpensive way to make chicken liver taste like Foie Gras! For this class, you will have a variety of poultry to choose from. The technique that I will teach you will be the same, regardless of the poultry that you use. What you will learn from this class, will help to improve your thanksgiving dinner. This year, surprise your guests with a unique dessert and what better way to surprise them than with a pumpkin crème brulée! Everybody will have fun with the torch! This dish can be prepared with many different kinds of fish, such as salmon, rockfish or others. The contrast between the temperature and texture make it appealing. Red cabbage is full of vitamins. For this class we will be keeping the cabbage raw which will preserve all the nutrients. How can something so easy to make be so good? The main ingredients of this dish are puff pastry and fresh figs. When figs are out of season, they can be substituted by other seasonal fruits such as plums or apricots. Fresh artichokes can be a little intimating to cook, but Chef Patrice will teach you an easy technique to cook the artichokes. For this class we will stuff the artichoke bottom with crab meat mixed with a creamy sauce. This is better than pizza and easier to make! It can also be made with different ingredients and customized to your own taste. The season for soups is around the corner so let’s get ready. This soup is very smooth and rich in flavor. The cranberries add texture and acid needed in this recipe. “Lapin sauté chasseur”. You can’t go more classic than that with this famous French dish. Mushrooms, caramelized pearl onions, and bacon are some of the ingredients. If you have never eaten rabbit, don’t miss this opportunity to cook and taste something that you have never cooked before. This dish can be served at any time, breakfast, lunch, brunch or even for dinner. Everyone will enjoy it! For this class Chef Patrice will teach you a basic recipe, which by changing the garnish opens a lot of different ideas. You will also make a beautiful mixed salad to go with the frittatas. Need a new idea to prepare apples? This class is for you! Apples are all over the farmer’s markets. They are so beautiful and so tasty! Let’s take advantage of it. The pecan nougatine will become your favorite candy after you make this very addictive pecan bridle. This dish is cooked with Riesling wine, wild mushrooms, baby carrots, pearl onions and much more. Chef Patrice will teach you how to make this dish taste fabulous and minimize your time spent in the kitchen. Let’s take advantage of the last fresh summer peaches available and prepare this delicious and easy to prepare dessert. Replace the peaches with other fruits to achieve different amazing flavors! Working with uncooked ingredients and making them taste good together is a tricky task but when done right, it is done in harmony. That is the goal for this cooking class with Chef Patrice. This is the best time of the year to put together a dish like this because the ingredients are at the pick of their season. Leeks are mostly used for soups. In this class, you will learn a new way to cook leeks. This is an easy recipe to follow and very cost efficient. First, the leeks are blanched. Next, they are stuffed with country ham and vegetables. They are then braised in the oven for 30 minutes with tomatoes and fresh herbs from the garden. This is a refreshing and simple dessert to make. You need to make sure to get some well ripe peaches to make the soup even better. You will be making French meringue and caramel to go with your soup. Chef Patrice will demonstrate good cooking technics in this class that can be used for many other recipes. Making your own beef Carpaccio is the best way to control the quality of the beef. For this recipe you will use beef tenderloin, the most tender cut of beef. It’s easily put together in no time and tastes delicious. Oven Roasted Whole Rockfish with Fresh Herbs-French Green Beans and boiled Potatoes-Olive Oil Vinaigrette. Who wants to know how to cook a whole fish and learn how to serve it? If you are one of those people, this class is definitely for you. In this class, you will roast a whole wild Rockfish in the oven with fresh herbs and olive oil. This method is the best way to cook fish. It will end up having more flavor and most importantly it will be very moist. Chef Patrice will show you an easy way to remove the filets off the bones to serve it. Don’t miss this class! It only takes a few avocados to make a lot of soup. The soup is also made with chicken stock but can be substituted with vegetable stock to make a perfect vegetarian dish! What you will learn with this class is how to adjust the balance between sweet, sour, bitter and salty. You will also learn how to oven roast vegetables for the ratatouille. You will never miss a poach egg after this class! Understanding the entire process is the key to make them perfect every time! Of course you will not leave this class without knowing how to make the famous Hollandaise sauce. Chef Patrice will guide you every step of the way. This classic French dish from Nice is perfect for a spring lunch. With a chill glace of Rosé from Provence makes it even better! For dessert a light crème brulée with refreshing rhubarb and almond tuile cookie. Mushroom potatoes croquette salad is a perfect dish for the season! This dish includes candied walnuts, cranberries, apples, and is tossed with spinach or arugula and finished with Parmesan chips. For this cooking class, you will learn how to filet a whole round fish. I will teach you how to pan sear the fish to get a crispy skin. The balance of flavors is just perfect! Between the natural sweetness from the butternut squash purée and the acidity from the lemon emulsion butter, this dish will appeal all fish lovers. The soup we will be making this week is a specialty from the south of France where I was raised. It is made with vegetables, cannellini beans and orzo pasta. It is topped off with pesto and parmesan cheese. This soup will be the best soup you will ever make! Shepherd’s pie can be delicious and easy to prepare! It was originally made with ground lamb but for this class we will be using ground beef and chorizo. Comfort food is always in demand! The crab season is around the corner! So let’s get a head start and make a crab meat custard with chive butter sauce. Your guests will want more and certainly ask for the recipe. You might think that making a nice roast beef sounds easy, but do you know the proper techniques? I will teach you what the professionals do to achieve success and make a perfectly cooked roast beef. Of course this class would not be complete if we were not making flavored tarragon jus to go with the beef. Have you ever made French fries with polenta? Well if not, we will make it together in this cooking class. When sprinkled with some grated Parmesan cheese, they will turn out amazing! This wonderful tomato soup will wake up your taste buds with the first spoon! The balance of sweetness from the sweet corn and acidity from the tomato needs to be perfect. I will show you in this class how to make this adjustment. Our main dish will be fresh tuna steak with black peppercorn sauce. We will be using the same recipe we used to make the famous French “Filet Mignon au Poivre”. The good thing about fresh tuna is that it can be treated like a steak. It is cooked at the same temperature and uses the same sauce. Summer roasted vegetable in the oven and potato kebab wit fresh peaches. All vegetarian for this cooking class! If you like flavors from north Africa, you will enjoy to make this lamb burger. Harissa, mayonnaise and shoestrings potatoes makes it so perfect! Always wanted to make this dessert but to scare to try? Take this class and succeed! Making canapés, hors d'oeuvres, is time consuming, but if you are organized you will enjoy making them and your guests will be amazed! For this class, I will inspire you to create beautiful canapés for the holidays. I also want to teach you how to make French Macarons with butter cream. If you want to test your pastry skills, this is class for you! You will learn in few easy steps, how to make this Famous Spanish dish. Since we are covering Span let's make some tapas. Smoked salmon on a fillo dough cups, oven roasted tomatoes is on the menu. For this class, I want to teach you what I have learned from the great chefs I had the chance to cook with. I learned how to make this dish a long time ago but it is still one of my favorites! Alsace’s most traditional dishes are a blend of German and French influences. One of these dishes that I have learned is called “choucroute Alsacienne”, which means Alsatian sauerkraut. Like many French dishes, the roots of choucroute Alsacienne are its economic value. “Peasant food” offers a lot of great recipes, and this one is no exception. Smoked pork, ham, hot dogs, and German sausages are examples of cheap foods that peasants would prepare for their meals. This Saturday, we will be traveling back in time and cook a traditional peasant dish. Also on the menu Beet Salad with Orange Dressing and Feta Cheese. Sous-vide is French for “under vacuum” and refers to the process of vacuum which is sealing food and cooking it in temperature controlled water bath. The most obvious benefit of sous-vide cooking is that you can prepare perfectly cooked food every time you step into the kitchen all with very little effort. No more overcooked fish, rubbery chicken, or chewy steak! Do you need special equipment to cook sous-vide? Yes, but I will show you how to do it without the fancy devices. For this class, I will demonstrate with and without a cryovac machine and a circulator. Lamb shank with French lentils and roasted beet salad with warm goat cheese. These are the perfect dishes to cook on Saturday and eat it on Sunday! Life cannot get any better than that! Cooking it slow is the key to be successful with this dish. While we wait for the lamb to become nice and tender, we will prepare a roasted beet salad with pan-fried goat cheese. The contrast between the cold salad and the warm goat cheese, makes this dish unique! If you like lamb with lentils and you want to cook on Saturday and relax on Sunday in front of a delicious meal, this class is for you! Chilled Lobster with Corn Leek Relish and Lobster Tarragon Sauce Watermelon, Feta Cheese Arugula. I want to teach you everything I know about lobster! Cooking them, making sauces, and taking the meat out of the shell safely and efficiently. Chilled Lobster with Corn Leek Relish, Marinated Butternut Squash, and Lobster Tarragon Sauce. This Lobster dish was served at the White House for The China State Dinner in October 29th, 1997 and I was there to prepare it. I will teach you the original recipe! What makes a good onion soup, are the different techniques that put it together. Making the bread crunchy and melting the cheese just right are some of these techniques, but they are not easy to accomplish. I will teach you a simple way to make it perfect every time. Are you ready to break down a rack of lamb into beautiful lamb chops? Well if you are, sign up for this class and sharpen your knives. 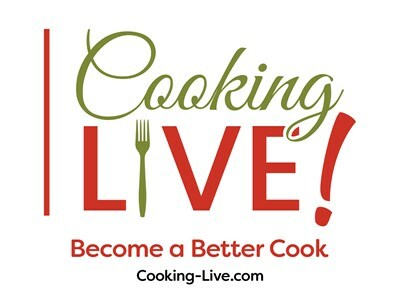 This cooking class is for you! We will make a rosemary jus from scratch with the trimmings from the rack. To go with that, a nice soft polenta. Pot-au-Feu is probably one of the oldest dishes because its history goes all the way back to French origins. It’s not a too difficult to prepare. Everything is cooked in the same pot which makes it a perfect dish. It can be made ahead of time and reheated in a few minutes and dinner is served! This Saturday, we are making another classic. Crêpes Suzette! Learn how to perfectly cook puff a pastry shell and fill it up with a creamy wild mushroom ragout! Never cooked skate wing before? This class is for you! For this class, I want to demonstrate different ways to use and cook a fresh fish such as flounder. Braising and making the sauce out of the liquid that the fish was cooked in, adds an abundance of flavor! I will also teach you how to fillet a whole fish and use all of the bones to make a stock. The apple “Charlotte” recipe was created by Chef Jean Louis Palladin. He was inspired by the classical French dessert, “La Charlotte aux Pommes.” You are going to be amazed with what you can do with a slice of bread, some butter, and a beautiful apple. This week on Cooking Live, I will show my way of grilling salmon or other fish on cedar plaque. I want to take advantage of that fresh, sweet, white corn and make corn chowder. We will serve the soup with a roasted Campari tomato to bring some acidity to the dish. The fried tortillas julienne add the texture and make this soup perfect! You will not be able to resist such a delicious meal! This class is going to be filled with great cooking techniques that Michelin star restaurants use in their kitchen. The first thing we will do is break down a whole chicken and then roast the bones in the oven with some mirepoix to concentrate the flavor. While the consommé is simmering, we will make some fresh pasta dough and put together some delicious mushroom raviolis. You will be working on your knife skills during this class by cutting a very fine julienne to garnish the consommé. This creamy and rich chestnut soup will make you want to ask for more! This soup can also be made with vegetable stock and will please all your vegetarian friends. Making food creamy and rich is the topic of this cooking class! Poaching an egg and then frying it is a really interesting technique! The yolk is soft and creamy and the white is crispy! It is served on a watercress coulis which makes this dish perfectly balanced. This is a great idea for brunch! Perfectly oven roasted birds! You will also learn how to make a flavorful Jus with the bones. This class will enrich your pastry level, we are making pate a choux! Tomatoes and peaches are a good combination for gazpacho. Get ready to make fresh pasta on this class, you will learn an easy way to make pasta dough! Perfect way to prepare a duck breast!